The tea forest of Jing Mai is called a natural tea tree museum due to the extraodinary ancient tea trees growing there, some up to 800 years of age. Da Shu Cha (translates to "Great Tea Tree") tea cake is produced using tea leaves picked from old trees in the Jing Mai tea forest. Due to their height, the tea leaves are harvested by the local minorities there with the help of tall ladders. 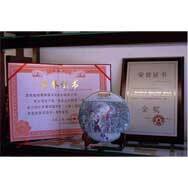 Pu'er tea from Jing Mai is known to have strong distinctive fragrance. 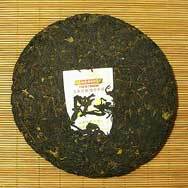 This tea cake won the Gold Honour in Shanghai Tea Expo in 2007. 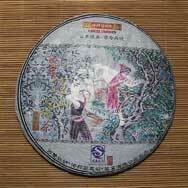 All Yi Bang Cha Ma Si Tea Industry Co. Ltd. cakes are compressed using stone mold. Fairly strong cha qi, somewhat nutty and orchid-like taste. Feels good. New to puer. Bought 6 different ones to taste. This tea is delicious. I save it for special occasions. Really delicious. As far as tasting notes, I can´t really tell you if it´s plum like or apricoty or tastes like coffee beans fermented in the stomach of a civet. But it´s rich, full, sweet and delicious. I will be buying many more of these. 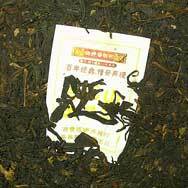 This is an excellent tea that is slightly sweet and has lost most of its bitter flavor. It brews up to a light amber colored cup. I would definitely buy it again. Aromatic, sweet, and fairly smooth. The tea tastes and looks older than a 2007 vintage. Very good after-taste. An excellent tea from this brand. This tea is still young, but it has strength to it. No off flavours and resonably easy to drink.